The LEGO Movie 2: The Second Part, the highly anticipated sequel to 2014's The LEGO Movie, finally releases this weekend and perfectly continues the clever humor of the previous movie. While fans have had to wait five years for the sequel, two LEGO Movie spin-offs have been released over the past few years to keep fans entertained, yet The LEGO Movie 2 is seemingly only willing to acknowledge one of those spin-offs. The first LEGO Movie spin-off released in 2017 was The LEGO Batman Movie, which followed the personal life of Batman (Will Arnett) in Gotham. It had an enormous, star-studded cast and received great reviews, feeling more like a superhero parody than an actual superhero movie. It carried the same amount of charm and humor that made The LEGO Movie such a huge hit, raking in over $300 million at the box office, which is certainly quite the achievement. Without spoiling anything, The LEGO Movie 2: The Second Part does acknowledge The LEGO Batman Movie, at least during the first 20 minutes of the sequel. The movie opens by disclosing everything that has happened to our LEGO heroes over the past five years, which Batman is notably absent from. One of the members of the Justice League acknowledges this by stating that he is off on his own solo adventure, which as we know is The LEGO Batman Movie. By the time we get to present day, Batman breaks the third wall by recapping everything that has happened to him since the end of his movie. 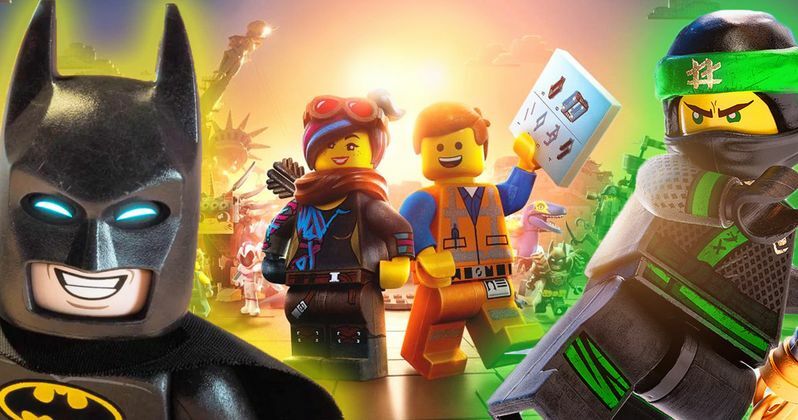 Batman even brings Alfred (Ralph Fiennes) from The LEGO Batman Movie into The LEGO Movie 2, despite Alfred not appearing in the first LEGO Movie. The second LEGO Movie spin-off to release was The LEGO Ninjago Movie. Though none of the characters in The LEGO Ninjago Movie appeared prominently in The LEGO Movie, the movies were established to be part of the same universe, with the tone and rules of the world being almost identical. A couple characters from The LEGO Ninjago Movie did technically appear in the background of the first LEGO Movie, but it was never clarified if these were meant to be the same characters or if they were just identical minifigures. Unfortunately, The LEGO Ninjago Movie was not a huge hit, bombing both with critics and at the box office. In order to keep itself distant from the box office bomb that Ninjago ended up being, The LEGO Movie 2: The Second Part makes absolutely no references or connections to The LEGO Ninjago Movie. Even the background Ninjago characters from the first LEGO Movie are absent from the sequel, with this new primary movie in the LEGO franchise going to great leaps to separate itself from the failed spin-off. While some movies tend to ignore their spin-offs entirely, it's actually good to know that The LEGO Movie 2: The Second Part is picking and choosing what toy spin-offs to acknowledge or not. The LEGO Batman Movie was a great spin-off that expanded the universe and kept the charm of the original, so it's great to know that it's being kept as a defining aspect of the franchise. The LEGO Ninjago Movie did not live up to the rest of the movies in the series, so it's safe to say that any inclusion of the characters from that movie would have felt forced and possibly ruined certain aspects of The LEGO Movie 2. Perhaps we will see more LEGO Movie spin-offs from Warner Bros. Pictures in the future, because for the most part, this franchise has been a huge hit.